HappyThemes Review (2019): What’s Good and Bad About them? HappyThemes is my latest hot find and in 2018, I started using HappyThemes products for my various blogs and this HappyThemes review shows why you should go with them. Some might already know I always use various themes for my niche sites to safeguard from competitors and I listed some of the Best WordPress Themes to use. Let's see what so special about HappyThemes. 4. All Common Features are present. HappyThemes are the latest WordPress theme providers and one thing you'll notice after visiting their WordPress Themes listing page, you can never take your eyes off. All the themes are eye-catching and come with loaded functionalities. Being new to the industry, I was little worried about their support team knowledge and response time but to my surprise, they're fast enough to answer the queries and for hard queries, they always come with additional codes which solve the issues quickly. The avg. response time is good and I'm happy with them. Who hates to use new themes with rich features for their websites. HappyThemes promises to deliver 10 new themes every year and they did the same in 2017. In 2016, they launched over 16 themes. How many of them badly looking to integrate coupon plugins into your blog? Like if the user clicks the coupon, it automatically copies the text and also opens the link. Currently, most of the similar functional plugins cost you more than $30 but you can get the same with HappyThemes for free of cost. I tested one of their themes and guess the theme gets loaded faster and also comes with good Google Page speed score of 92 out of 100. Actually, this shouldn't be in cons. Most top themes providers like StudioPress, Elegant once started with no theme panel and later they introduced it. Likewise, it takes some time for this small theme development company to come up with such panels. However, you'll get the best customizations options through customizing feature in WordPress Dashboard. Drag and Drop WordPress Theme Builder is the latest option most themes companies are introducing which enables anyone can design any part of website with zero coding knowledge. Some of their themes have smaller bugs like extra bullet points at unnecessary places etc. However, as described earlier, they're quick enough to solve the issues. While writing this HappyThemes Review, there are more than 15 themes and I put the five best themes which I use for my sites. 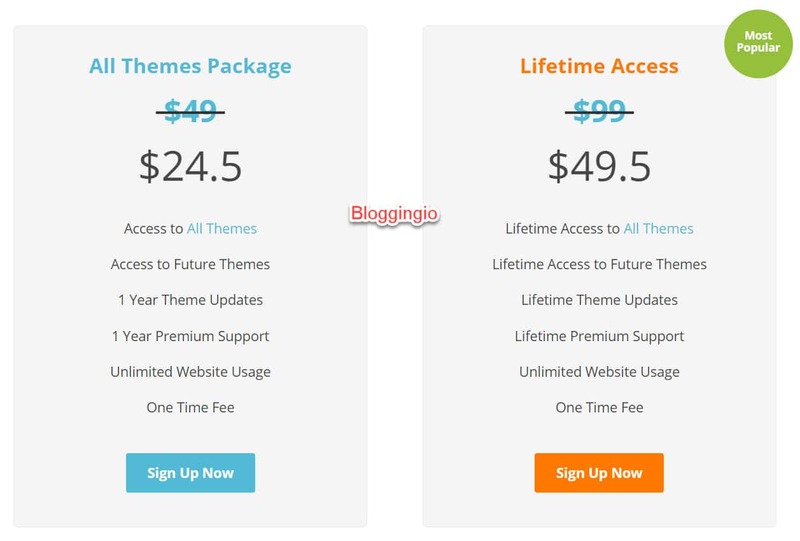 All themes lifetime access costs $99. However, Happy Themes are running some discounts for early adopters and lets see the Happy Themes Coupon. I was one of their very early adapters and I got 75% OFF in their lifetime package. Now they're offering FLAT 50% OFF on their yearly and lifetime access packages. Remember, once they hit a maximum number of purchases, they might reduce the discount to 25% OFF or even stop the whole discount things. So the best time to get Happy Themes is NOW. There is nothing better than lifetime discounts. Remember you can access their themes in upcoming years with no limitations and no additional charges. I hope this HappyThemes Review helps you to know more about the company and its products. Regarding HappyThemes discounts, you can enjoy the till the offer lasts. I love their Revenue theme but it needs to update. I bought the life access package and asked for refund the next day.That was on the 31st of December 2018. Today we have the 22nd of january 2019 and still no answer from happythemes. customer service does not exist.I am very disappointed and consider them cheaters.